It’s true that revolutionary artist Frida Kahlo and straight-out revolutionary Leon Trotsky had an affair when Trotsky was living in Mexico City in the years before his assassination. As far as we know, the pair never had a child, but the one imagined by writer Craig Harwood and performer Natalie Gamsu in Carmen, Live or Dead is an appropriately revolutionary figure. Carmen Frida Leon Davidovich, played by Gamsu, has lived a chaotic life: ripped from her peaceful existence with her mother in Mexico, she found herself growing up alone in a remote boarding school and eventually ended up following her heart all the way to Woy Woy. Hers is a story of an abandoned child seeking family and a place to belong. 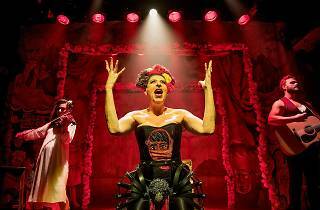 Harwood traces Carmen’s unusual path with wit and verve – if uneven tone shifts and often unsuccessful comedy – in this cabaret directed with precision by Shaun Rennie. Performed on a small timber stage with a dramatically painted proscenium arch emblazoned with images of Trotsky and Kahlo (the attractive set design is by Dann Barber), the performance is Carmen’s last. This is the day of her death and a time to reflect on all she’s seen and done in her very full life. A life that’s been coloured, to a large extent, by the fact that she was born intersex. For those who don’t know, intersex is the ‘I’ in LGBTQI and refers to people who have sexual anatomy or a chromosome pattern that can’t be classified as typically male or female. The proportion of people who are intersex has been placed everywhere from .05 per cent to 1.7 per cent depending on definitions; it’s not a massive number, but I can only ever recall seeing one piece of theatre that even mentioned intersexuality. 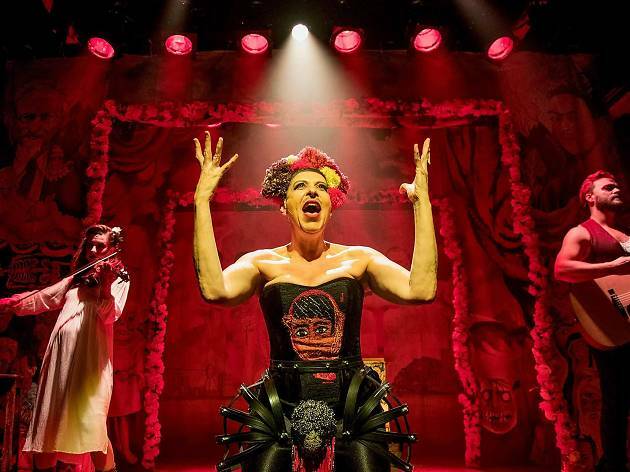 Carmen, Live or Dead isn’t a breakthrough work in representing an intersex experience – and its frequent and joyous use of the now outdated label ‘hermaphrodite’ feels a little insensitive, even if some intersex people use it to describe themselves. But it is an intriguing exploration of a figure who’s ripped between worlds and finds it impossible to find a place where she belongs, in terms of her identity, expression, politics, art and sexuality. Presumably her intersexuality is intended as a larger metaphor for all of this, and the defiance of those who find themselves at odds with society’s expectations. But it feels undercooked and untethered from the lives of Kahlo and Trotsky. A handful of excellent songs by songwriter iOTA, written specifically for the show, are brought to life by musical director Andrew Kroenert, who moves between guitar and piano, and Stefanie Jones on violin. Both are also accomplished actors and step comfortably into the shoes of the people who have touched Carmen’s life. Gamsu’s heavy contralto singing style isn’t always perfectly in step with the sensitive and insightful rock balladry that dominates iOTA’s score, but she’s a compelling and commanding figure, digging deep into Carmen’s tumultuous last day on Earth. Gamsu bounds forth through every scene and is an eminently powerful performer. Both she and the writing lack the necessary nuance at times, but her steamroller approach goes a long way towards selling the material.